This Limited Edition 2017 embodies the genuine character of the distillery. 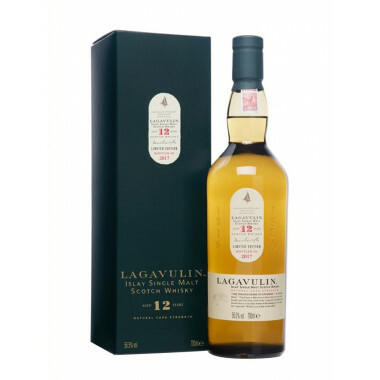 Lagavulin offers with this limited edition 2017, its 15th edition of the series Special Releases. This 12-year-old is a Single Malt which develops magnificently the peaty and powerful character of the distillery located on the wild west side of Islay. From a meticulous selection of the distillery, this new expression has aged for a minimum of 12 years in second fill hogsheads, assembled in American white oak. True to the character of the distillery, this Lagavulin is of great richness, both powerful and direct, while offering an exciting tasting. It is a whisky with multiple shades: smoke supported by mineral touches and fruity notes. Built in 1816 on the South-East coast of Islay, not far from the ruins of Dunyvaig castle, old fortress of the Lord of the Isles, the Lagavulin distillery produces a Single Malt almost as legendary as the island where it was born. Amongst Islay malts recognized for their peated and smoky character, Lagavulin is known for its complexity and depth: powerful, intensely peated, it is also rich, round and mellow. This double character is the key to appreciate the two new versions bottled at cask strength recently released by the distillery. The unique quality and style of Lagavulin whiskies ranks the distillery in the Classic Malts Selection. Created more than 20 years ago, this selection recognises Single Malts crafted in the tradition of iconic distilleries, and offers the most impressive whisky styles Scotland has to offer. Nose: clear and round, it leaves to express intense and grassy notes with incisive and pleasant smoke. We discover rich and mineral notes of liquorice, pine, fern and hot sand. Smoky notes develop with power, they are more likely and evoke the grilled meat and the smoked wood. Further, over time, we can feel with frankness the fruity sweetness of the apple, the pear and the banana. Palate: while powerful, it is very affordable. We find a mixture of intensity and sweetness, a first exciting experience that is quickly substituted by grassy notes. Aromas of sugar, burnt leaves and smoked meat blent in a rich balance with spicy notes (nutmeg, cinnamon and black pepper). Finish: soft and of medium length, with persistent smoke in the background.